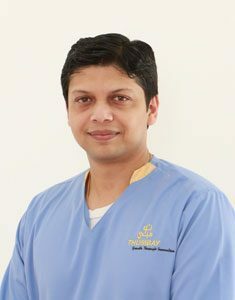 Dr. Indraniil Roy is a distinguished Oral and Maxillofacial Surgeon who joins Thumbay dental hospital, Ajman with many years of specialized training in Oral and Maxillofacial Surgery and Advanced Dental Implantology. He received his master’s degree(MDS) from KLE University, Belgaum, Karnataka, India and earned the prestigious fellowship of the international congress of oral Implantologists which sets the benchmark for quality dental implantology practice around the World. He also has a fellowship from the Indian society of Oral Implantologists and Recently he was conferred the fellowship of Indian college of surgeons. He also performs complex maxillofacial surgical procedures such as surgical procedures related to Facial trauma or severe space infections, cysts Enucleation, removal of benign hard and soft tissue tumors in the oral cavity as well as head and neck.